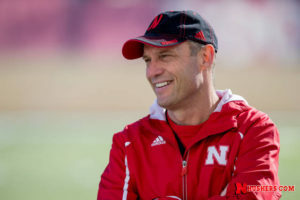 Nebraska coach Mike Riley says the Huskers have a unique situation at quarterback as they prepare for a Black Friday visit to Iowa. Riley says Tommy Armstrong is improving after missing Saturday’s game against Maryland with an injured hamstring and Ryker Fyfe is questionable after he led Nebraska to a 28-7 win over the Terrapins. Zack Darlington moved from receiver two weeks ago and was the backup against Maryland. Riley says he did not know when asked who would take the first team reps in practice Monday afternoon. Nebraska takes a 9-2 record to face an Iowa team that is 7-4 after wins over Michigan and Illinois. Riley believes the fledging rivalry with the Hawkeyes will continue to grow but it is already big enough for senior safety Nate Gerry.